Friday morning is literally the calm before the storm. I got out of the house for the last bit of freedom in advance of being snowed in, under 2+ feet of snow, for the next 48 hours. All school systems closed in advance of the storm. In Washington, DC, the Federal Government closes at Noon US EST. Most stores are cleared out of the essentials – Toilet Paper, Milk, Eggs, Bread. I hit Giant Foods this morning to grab some extra decaf tea. I was surprised to find they had milk, bread and TP, though in small amounts. They must have restocked early this morning, as people in the neighborhood said the shelves were bare as of last night. Sand trucks with plows are stationed at most major intersections. Everyone is in waiting mode. 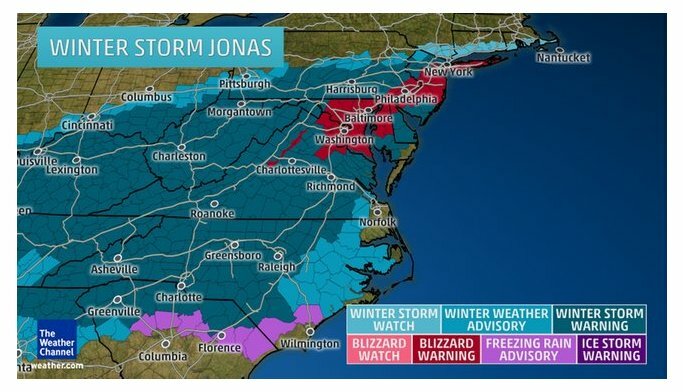 We are in the Blizzard Warning zone, bullseye, ground zero – whatever we’re calling it. 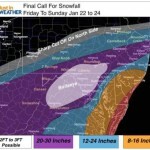 We’re anticipating anything from 1-3 feet of snow, but most likely ending up in the 16-24 inches range. With my husband out of town, and not looking forward to handling the shoveling myself, I hired out a group of kids with a snow blower to come by mid-storm on Saturday. If that allows me to only have to shovel 10″ of snow later, I’ll take it. I’ll likely shovel out the front step a few times over the next 24 hours, just to have a way out of the house if necessary. Anything that can be used as a battery is plugged in and charging: Old laptops, USB battery packs, phone. Two hand-crank emergency lights are also plugged in – one of those has a built in radio as well. The gas oven can’t be lit if the power goes off, but the stove top can be lit with matches. I’ve got plenty of soup, pasta and rice should we lose power. Tea and coffee can both be made stove top. If the power holds, I have plenty of other food. I’m less worried about the amount of snow, and more worried about losing power — staying warm and keeping pipes from freezing. I’ve sealed the front door and the door to the garage as both doors are very drafty. Much warmer on the basement level now. Husband’s United Airlines flight home on Sunday was cancelled while he was in the air yesterday flying to New Orleans. I sat on hold with United for 1h 25min last night, finally getting Husband booked on a flight home Monday afternoon. The neighborhood should be plowed out by Monday. I am unhappy that this storm is coming while he’s away. For those of you in the path of this storm – wishing you all luck. Be safe.